This boshuis is part of “Oubos Echo Estate” just outside Bloemfontein. The specific site within the estate has large indigenous trees that needed to be preserved. 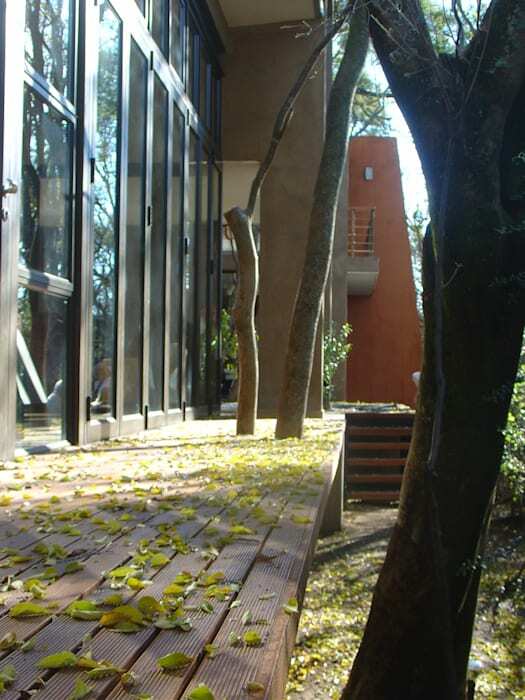 The house was fitted into the empty spaces between these trees resulting in a house opening up towards nature. The fold-away doors allow for easy spatial flow between inside and outside. The southern bathroom boxes, clad in copper sheets, will turn green with time and make the house disappear into the forest, with only the sculptural red wall dancing through the trees announcing its presence.